Bullying is the repetitive, intentional hurting of one person or group by another person or group, where the relationship involves an imbalance of power. It can happen face to face or online. What kind of things can happen to you when you are being bullied? What can we do if we are being bullied in school or college? Any one can experience bullying even adults, what we need to know that this is wrong and is unacceptable. There are a number of things that we can do to stop the bullying. Tell an adult, a friend or a teacher, get support, help and advice from people you know and trust. Block the bullying if it is via your phone or social media. Some phones will let you block numbers. You can also block, delete or unfriend other users on lots of social networking sites. Stopping them from contacting you could help you feel less stressed and upset. You can also change your walk home or avoid them in school to stop them talking to you. Practice being assertive. Being assertive means being able to stand up for yourself without being aggressive. If you’re assertive, you can say what you really think without being pushy or rude. Sometimes it can be hard to say what you really feel, especially if it means disagreeing with someone else. You can practice being assertive by writing down what you want to say, and choosing the right time to say it. Over time, being a bit more assertive can really help get bullying stopped. Build your confidence, bullying is nasty, and it can make you feel bad about yourself. But there are ways you can pick yourself up and feel good about who you are. That might not make the bullying stop right away. But often being confident can help get the bullying stopped over time. 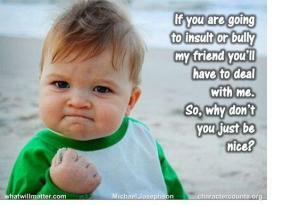 Sometimes people will join in with bullying because they are afraid that if they don’t join in it will happen to them. This is not true if people spoke out and stood up to bullies this would help stop them, they are usually doing it to get attention because they have a number of problems and issues. Bullybusters can help you click here, or call free on 0800 169 6928. They can give you advice on steps to stop your bullying. www.kooth.com – A unique service that provides vulnerable young people, who have emotional or mental health problems, with support when they need it most. www.childline.org.uk – get help and advice about a wide range of issues, talk to a counsellor online, send ChildLine an email or post on the message boards. Youngminds – Children and young people’s wellbeing and mental health. need2know – Helpful articles on how to deal with issues around bullying.